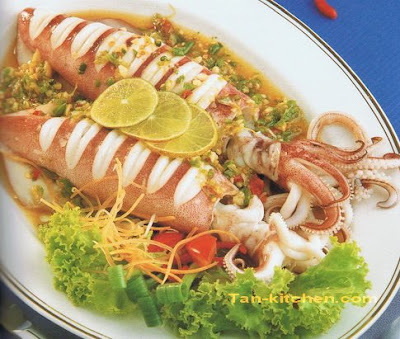 Steamed squid with lime sauce in Thai called "Pla Meuk Neung Ma-Nao" (Pla Meuk = Squid, Neung = Steam, Ma-Nao = Lime) This delicious squid preparation is an excellent fresh and healthy side dish to dinner. Use fresh squid for the best texture and flavor. Wash the squid well after removing the inedible portions. Place a steamer half filled with water on medium heat. When the water is boiling, steam the squid for between three and five minutes. Remove them from the steamer, cut into bite-size pieces, and arrange these on a plate. Put the fish sauce, lime juice, and sugar in a bowl, stir until the sugar has dissolved. Add the garlic, chilli, and stir to mix everything together. Spoon this sauce over the squid and serve.